WARNING: This page is a list of speculative theories! Even though some of them might hold some ground, nothing here should be taken for granted and exists as a starting point for further investigations. It also has a temporal nature — it will serve no purpose and will probably be deleted once the Map is finally figured out. All of the games contribute to uncovering this image. We call it a map not just because it looks like one, but also cause at least some of the games refer to their pieces images as map piece themselves. The simplest and thus generally accepted theory is that the map is a path that starts at the triangle, goes along the lines through all the circles, warps across through the double line symbols (think pacman levels) and ends on the square symbol. Sometimes, for simplicity of understanding, the map is cut into two pieces and joined at the double line symbols like this. It's open for consideration if this is required. A lot of the game's pieces cover the same spots of the map. At least 6 pieces can be removed without damaging the full picture. The easiest way to explain it is redundancy: this way, if the community solving the ARG doesn't find all the needed pieces, they still can get the overall map. The pieces that form the map come into play at different scales or even artistic styles, and sometimes have to be extracted from screenshots at angles, so they don't fit with one another precisely. The exact locations of all the circles, exact positions of all the lines and corners should not be considered to be a part of the puzzle. It's all just fuzzy approximations. It looks like the circles are either on the corners of the path or on the arc. There are no two circles on the same arc, if one doesn't take corners into account. There were attempts to straighten the map from arcs into straight lines. 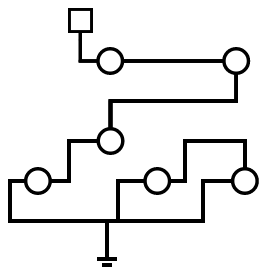 If this is done translating arcs into straight lines of the same length, it looks like this and this for two parts of the path. As you can easily see, a lot of overlaps. If this is done translating angles of the arcs into lines, it looks like this or this (if the parts of the path are combined). This approach is pretty much traslation of the coordinates from polar to rectangular coordinates. The image above represents the circle nodes positions as points on the path, ignoring that they are not sitting precisely with their centers on it or the size the circles would be after transforming. The map might not be a self-sufficient puzzle, but be a clue to something else. We are supposed to overlay the map image on something and get the result in the circles along the path. Can probably be some grid of letters. 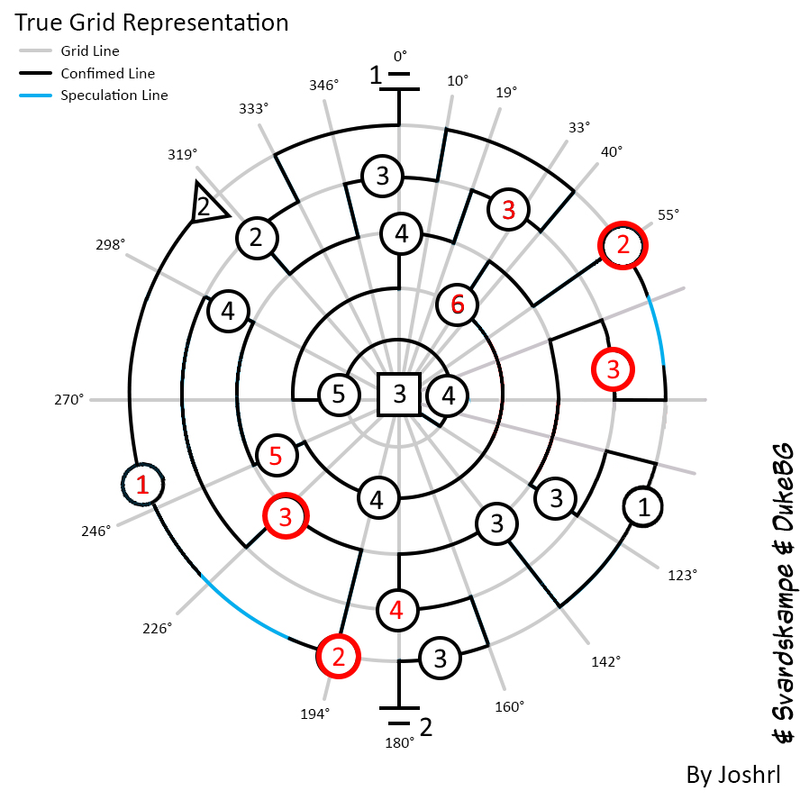 Maybe circular, but a regular "square" grid is a possibility too. Can be a grid of buttons and the map gives the order to press them. People have tried and suggested overlaying the map over real-life maps, though that requires knowing exact spot and scale. The overall earth globe is too vague due to fuzziness of all circles. Canberra comes up most often, being used as the name of the secret level in Mini Metro. The map might be an instruction to navigate a maze. One would assume that this maze would not have an obvious path, so the map would be required in the first place, so it whould look something like this. The map might be solvable on its own, as a self-sufficient puzzle. Cons: not apparent, how to read it. The number of circles and pieces might be the same (20 of each at the moment). 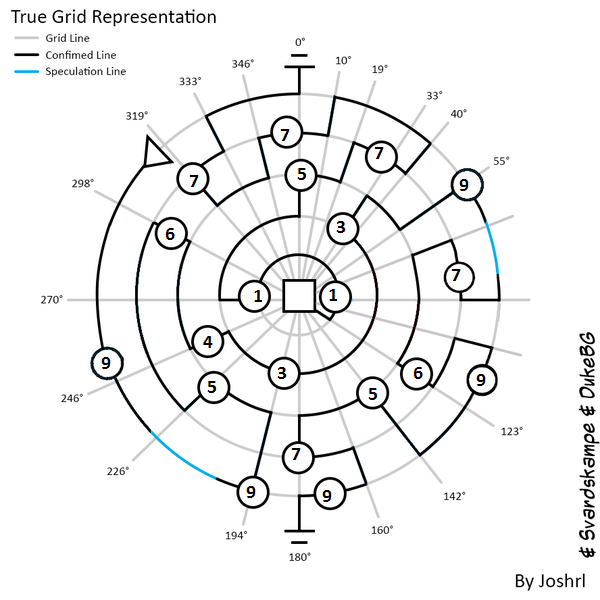 Figuring out how they correlate gives us a chance to assign each circle node something from the game "its piece" came from and read the result along the path. Also, there are 23 games/pieces now, so this is pretty much debunked. There is a theory that you should assign circle nodes that are fully enclosed in the pieces to those pieces. When there are multiple — exclude the ones "taken" by other pieces already. Read more here. After its postulating, this theory "predicted" the Clockwork Empires piece that would cover 100% discovered path again. However, Bombernauts piece almost sinked it and it had to be adjusted to include triangle shape as "assignable" too. Then QWOP piece completely sunk the theory. There are multiple ways to assign numbers to the circle nodes. These numbers might be decoded into something further. Just like another theory above, this ones requires finding all the pieces that makes the employed redundancy questionable. Or rather this theory being very questionable. 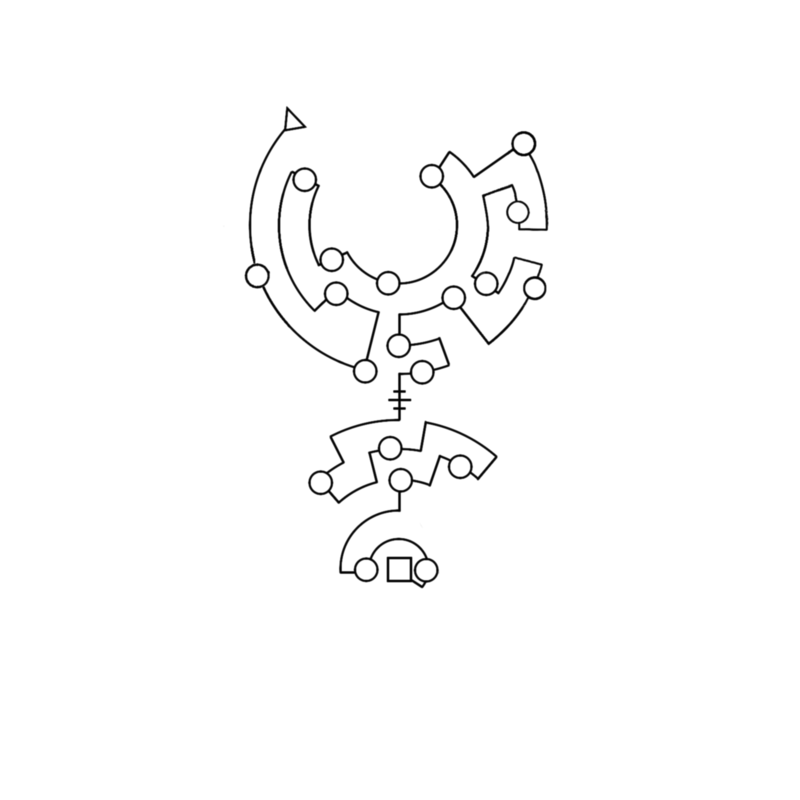 Pros: 5 lines; location of the circle nodes either on them or in between. One way to write them as notes would be this. It would sound like this. A different version that switches which concentric circle is the lower line and which the higher (and also a bit faster) sounds like this. It's possible to get some string of data by going along the path and algorithmically extract data from what is occuring. If you're trying to get binary data, try to assemble them in groups of 8 into bytes. It's also possible to extract three types of things and turn them into morse (dots, lines and separators). Taking circle nodes as 1 and circless corners as 0 gives ╥Y"*B!& in DOS/IBM ASCII (only the first character is from the extended part of ASCII). We can try going through the lines and counting if they have circles or not. Go along the path starting as a triangle and count an edge with a circle on the first corner or in the middle as 1 and no circle or a circle on the end as 0. This way gets rid of the few situations of a circle both in the middle of the line and on the corner. If you do it this way, you get 110101011100101001001010101 before the double lines and 000100100010010010 after. Conjoined and split into groups of five bits (because five bits are numbers from 0 to 31 and completely cover the alphabet) is 11010 10111 00101 00100 10101 01000 10010 00100 10010 or 26 23 5 4 21 8 18 4 18 or ZWEDUHRDR (A=1, B=2, etc). But in that the last 1 is on a line with both a circle on the beginning and the middle. We can get rid of it by reading the second part of the path in reverse – from the square to the double line. That would be 011001010001000100 then. Conjoined with the first part and split into groups of five is 11010 10111 00101 00100 10101 01011 00101 00010 00100 or 26 23 5 4 21 11 5 2 3 or ZWEDUKEBC (A=1, B=2, etc). If we do want to count the lines with two circles (on the middle and on the corner), we can get 211101012101101001001111101000110010001011012 going from the triangle to the square, which split in threes (that gives numbers in range 0 to 26) gives 22 10 5 10 10 1 1 13 10 0 12 3 1 4 5 = VJEJJAAMJ LCADE counting 0 as a space, and the double line portal as a single line with no circles. This page was last edited on 19 October 2016, at 14:23.